Dayvis McLeod delivers an RBI double to pull the Tigers within a run in the bottom of the third inning. Northeast Jones had a tall order for Friday night. 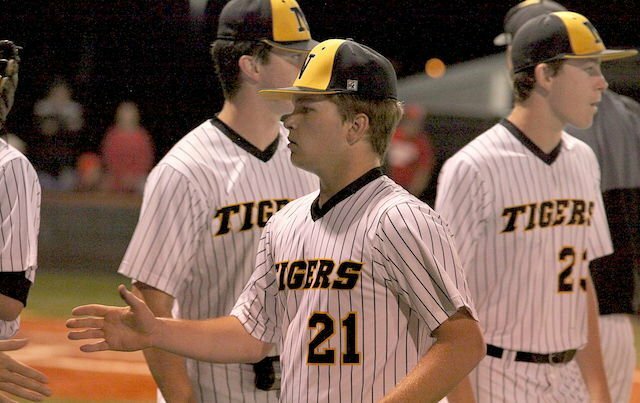 Not only did the Tigers need to beat perennial power West Lauderdale, but they needed to win by three runs to win the region championship in the final 5-4A matchup of the season. The Tigers played the Knights tough for six innings in The Jungle, but then the visitors erupted for four runs in the seventh and walked away with another title, 7-2. Kameron Partridge struck out 13, didn’t walk a batter and scattered five hits over seven innings in earning the complete-game victory. The Tigers spotted the Knights a 3-0 lead then battled back in the bottom of the third inning. Joey Withers ripped a single with one out to set the table for leadoff man Mason Smith, who came through with an RBI single. Dayvis McLeod then delivered an RBI double to pull the home team within a run. It remained 3-2 until the seventh, when Mason Willis and Partridge hit RBI doubles and Southern Miss signee Ben Etheridge (2-for-4, 2 RBIs) delivered a run-scoring single. Sophomore southpaw Dalton Tanner started for NEJ and pitched his way out of a jam in the fifth. Shelby Nowell took over in the sixth, then Brady Blackwell, Dylan Greer and Smith all went to the mound in the seventh to try to stop the bleeding. NE Jones (14-10, 8-2) had been perfect in region play until two showdowns with West Lauderdale (20-3, 10-0) last week. The Knights won at home 5-3 on Tuesday in the first matchup of teams that were undefeated in 5-4A. Parker said he didn’t want his players to be satisfied with just playing close, but he was pleased that they were competitive with top competition as they prepare for the postseason. “Now we’re getting ready for our playoff run,” he said. He’s especially pleased with that after his team started the season 5-6, then caught fire after spring break and ran the table against region opponents. “In the first part of the season, we couldn’t play dead in a western,” he said. But now, they’re looking strong after another strong showing against the team that has 14 state championships on its resumé and was state runnerup last year. The Tigers will play Raymond (8-14) in the first round of the Class 4A playoffs on Friday and West Lauderdale will take on McComb (8-13-1).